Heart of Romance is a love-themed slot machine brought to you by Konami. It uses a standard 5x3 layout with 30 fixed paylines. The reels are home to symbols depicted as a green-eyed lady with a mask, carnival masks, purses decorated and filled with emeralds, gloves with binoculars and clinking glasses with champagne. Wild is represented by the heart-shaped pink diamond and appears on the central reel exclusively to substitute for all other symbols bar Scatter thus completing your winning combinations. The giant yellow diamond with a crown on it stands for Scatter that is responsible for triggering the free spins feature. Land 3 or more Scatters anywhere in view and you will be asked to choose from five options. They include: 20 free games with Wilds turning into a 2x, 3x or 5x multiplier, 10 free games with Wild turning into a multiplier of 5x, 8x or 10x, 5 free games with Wilds acting as a 10x, 15x or 30x multiplier or 3 free spins with Wild multiplying your wins by 15x, 30x or even 40x. The fifth option is Mystery Choice and if you select it, you will get a mystery combination of free spins and multipliers. By landing 3 or more Scatters, you will reactivate the selected feature. What's more, throughout the game you will notice that the central reel is highlighted by the golden frame and has 6 instead of 3 positions. This feature increases your odds of winning because each of the symbols on the central reel counts as a separate icon. The top paying regular symbol is the lady with the mask awarding 500 coins for a five of a kind combination. This symbol and the one represented by the carnival mask pay when only two of a kind land on a payline starting from the leftmost position. Landing 5 Scatters regardless of their positions will earn you 1,000 coins. 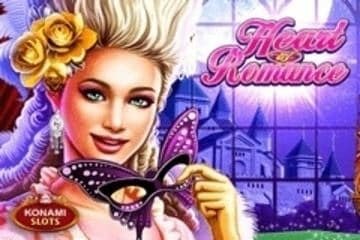 To play the Heart of Romance slot, you have to pay at least 45 coins, but if you are a high-roller, you can wager as much as 2,250 coins per spin. When playing at the maximum bet, you can win up to 1,500,000 coins in a single spin. The biggest attraction of the game is undoubtedly the free spins feature awarding insane multipliers going up to 40x. However, you can benefit from them only when Wild is included in a winning combination which will not happen that frequently as this special symbol appears only on the middle reel to complete your winning combinations. The good news is that two top paying regular symbols will earn you a prize even when you create a two of a kind combination, but such a combo will pay out only a part of your wager. Although the slot machine can provide you with a lucrative gaming experience theoretically, in practice it is not that rewarding or we just weren't lucky enough. Aesthetically speaking, this is another Konami land-based slot machine that was adapted for online play and kept all its features including sharp graphics that may seem a bit dated in comparison with the latest releases on the market. The same applies to sound effects, yet if you like the mechanical sound of land-based cabinets, you will enjoy Heart of Romance. Once you load the game, you may be overwhelmed by all the luxuries appearing on the reels. The game comes with an RTG of 96,06%, which is above the average and makes the game worth trying. With Lady Luck by your side, you may score some hefty payouts.